Over the years I have had the honour of working with a local software developer, Les Éditions 3D. I was introduced to the company through my university computer professor, Larry Katz. I had the opportunity to design packaging and branding for a french language learning software based on the Canadian Classic, Hockey Sweater children’s story. The work would involve designing the CD packaging and CD design. 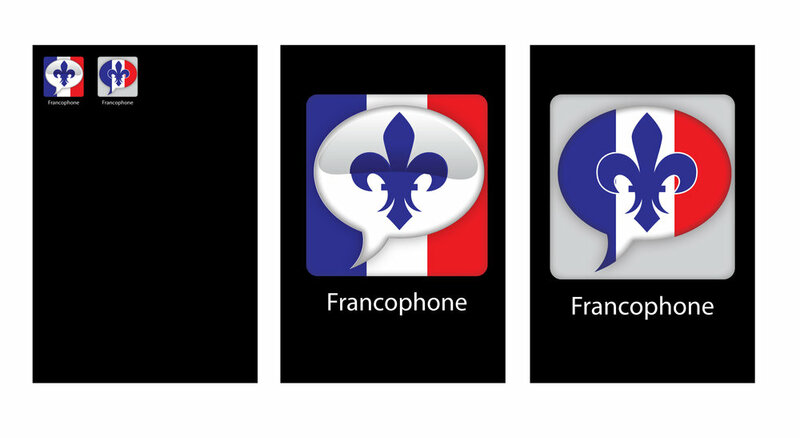 This time around I tagged in to assist with creating an APP icon brand for a new french language app, Francofone. Creating the icon and logo was a process. The creative was focused at first on the fleur-de-lis and French flag colours. My first round of concepts included a speech bubble to speak to the language element of the app. Showing how two of the first options would look in relation to usage on a smartphone. Narrowing down the design with a few different colour options. Final full logo design for branding and promotional needs. "People learn in different ways: visually, aurally and textually and Francofone addresses these learning preferences. FRANCOFONE consists of three apps that will help you improve your French and increase your knowledge of “la Francophonie” cultures. Our three multimedia apps, FRANCOFONE - VOCABULAIRE (this app), FRANCOFONE - LANGUE and FRANCOFONE - CULTURE each offer a variety of themes and activities for which several types of help, such as clues and audio, are available. FRANCOFONE - LANGUE will help improve knowledge of the French language and FRANCOFONE - CULTURE will help improve your knowledge of French culture around the world."